Money remains one of the most important facets of this election. The scandal over election financing at the 2013 polls tied to 1MDB is a major campaign issue in the urban areas, and, of course, money is being used to finance this campaign and woo voters, often through direct vote buying. Videos and pictures of cash handouts in GE14 have circulated widely, so much so that this is the norm. 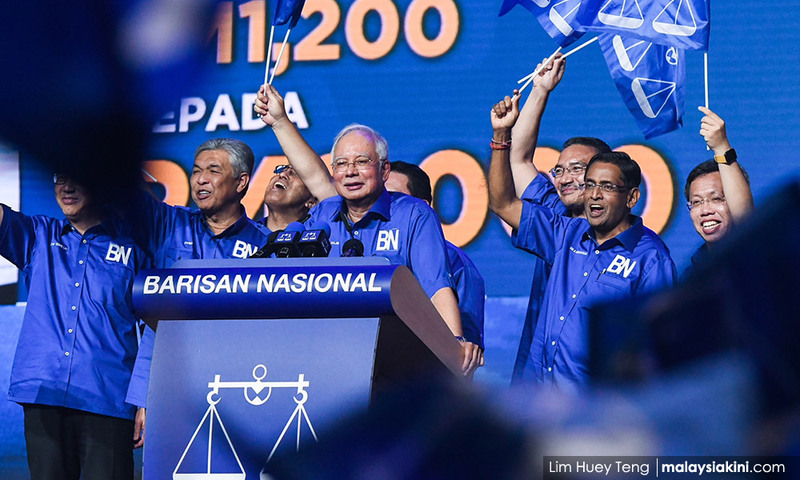 A conservative rough total estimate of promises made in this campaign by the BN reach RM100 billion – a figure drawn from a study of promises made by senior BN leaders since January this year as well as from published manifestos. This does not include the discretionary (and often non-accountable) funds allocated by the Prime Minister’s Office, estimated to have a budget of RM18 billion for operating and development expenses, and funds that have been brought in or donated specifically for party spending in the GE14 campaign. Despite the bonanza of promises and rewards, there are marked differences in how money is shaping GE14 compared to earlier campaigns. Spending levels in this campaign on the ground outside of the capital are lower, as the machinery for all sides has been less well-oiled. Money may have been pocketed but it has apparently not gone down to the same degree as the past. Importantly, there are more liabilities for caretaker prime minister Najib Razak in having a campaign dependent on money. GE13 was a campaign flush with cash, this time the cash seems to create more of an embarrassing flush for the BN campaign. When Najib announced BN’s 220-page manifesto with 364 initiatives last month on April 7 to a crowd of 40,000 supporters, he did so with fanfare. In the following week, almost all of the states introduced their own BN state-based manifestos, detailing many similar measures and expanding on a few. The manifesto identified 14 areas, from sustainability, housing to the economy and narrowed in on groups that have been left out, namely women and senior citizens. Some states also focused on youth as well, which was complemented by the Transformasi Nasional 2050 (TN50) initiative. A month later, much of this wide breadth of promises have largely been ignored in the campaign. Even the promises to increase the 1Malaysia People’s Aid (BR1M) programme, doubling payments at the lowest bracket and increasing outlays to lower middle-class families have had little traction. Unlike 2013, where 1Malaysia was everywhere, this time around there is little discussion of its actual measures and programmes. Three things have happened. First of all, the manifesto was an overkill – it is too much for ordinary citizens to absorb. It thus did not connect. There are so many promises in the manifestos of all the different parties – all highly populist in nature – that voters are essentially tuning them out. Many voters just don’t believe politicians. Second, Najib’s promises are the same (tired) song as last time. Najib has always anchored his electoral strategy on distributing rewards. As GE14 is a Najib election sequel, these promises are now expected and as such, less impactful overall. They are not new. Finally, there is a growing sense of entitlement that has deepened in the challenging climate of economic hardship. As people struggle, there is a sense that greater financial support should be distributed. It is important to realise that some of the promises in the campaign are actual government programmes already in place, such as the Pan-Borneo Highway. There is considerable double counting happening (in some cases, triple and quadruple counting). Many of the programmes have been announced earlier and have already started, so they are in fact not specific for the election itself. Also, some of the promises, such as 30% increase for women’s representation belie practices. The BN, for example, only increased its fielding of women candidates by 1.8%, and continues to be at a record low within Umno under Najib compared to previous leaders. More substantively, the BN is promising things it is supposed to be doing, helping the people. It is also necessary to acknowledge that while it is common for BN politicians to tend to conflate existing policies with new ones and vice versa, much of the manifestos are conditional spending, conditional on winning. 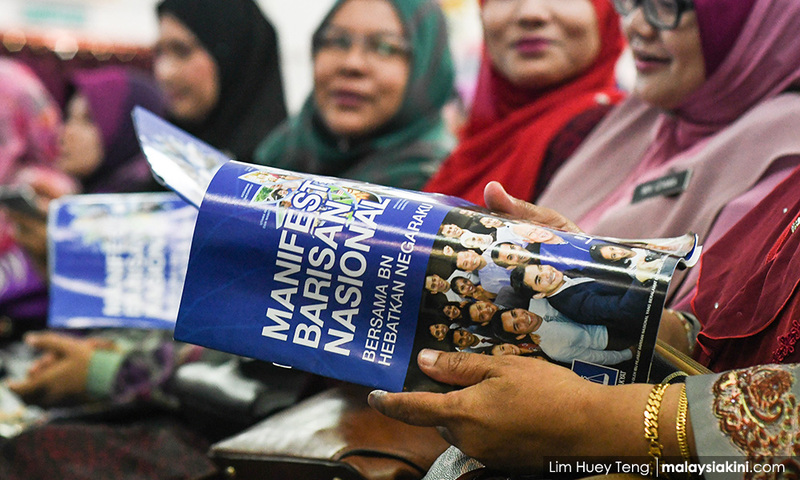 The RM11 billion promised on BN campaign posters in Kelantan is one example of this conditional spending, as it is seen to be allocated only as a result of BN winning the state. One of the most important shifts in GE14 is the introduction of the Goods and Services Tax (GST). All the opposition parties have promised to remove it, while the Najib government introduced it in 2015 and widened its scope by removing exemptions over the last year. Among ordinary voters, the GST is blamed for higher cost of living, and although it is not the only factor for inflation, it has contributed to higher costs. The revenue from the GST is expected to reach RM44 billion in 2018. More than ever, Malaysians are conscious of the taxes they are paying. Many see the BN promises as entitlement because they have paid for them. There is an additional dimension. It is the legacy of 1MDB. The scandal outside of the BN political base personifies corruption and abuse of power. Nowhere is this more apparent than in campaign spending. So, when they see and hear about the vote buying, which is endemic in the system, their anger against the Najib administration surges. Vote buying in GE14 strengthens Pakatan Harapan and hardens discontent against corruption. With RM2.6 billion reportedly deposited into Najib’s bank account, there is another sentiment: that they should get their share, especially within the Umno patronage base. Perceptions abound that Najib (and his wife) are ‘too greedy’ and should distribute more to the base. Ostentatious purchases and lifestyle a.k.a. diamond rings, handbags and quinoa reinforce these perceptions. So, when money goes down to the party machinery, there is jealousy and resentment of the amounts even though the sums are in fact larger than before, especially before 2013. Thus in this campaign, we see the adoption of a well-honed practice of “cash and carry” among Umno supporters and among many ordinary citizens. Malaysians love their shopping, and the distribution of the rewards (now usually primarily in cash) are being happily carried home. It remains to be seen whether the vote buying will actually be connected to political support to the extent as it was before. Patronage and vote buying has been crucial for the government in rural areas and among lower-class voters. However, Malaysia may in fact be reaching a turning point (which occurred in Indonesia in 2004) where vote buying became less effective in shaping outcomes. The message that is going around in GE14 is “take the money but vote the way you want – it is your money after all”. There is already a recognition that vote buying is having diminishing returns. This helps account for the less financial splash in GE14. The approach in Malaysia has also become increasingly more targeted, focusing on fence sitters and base mobilisation. This can still be effective as it is coupled with the changes in delineation and malapportionment, which builds in the movement of voters who are more susceptible to vote buying in competitive seats. The problems of vote buying speak to a more serious structural problem – campaign financing. In GE13, an estimated RM2 billion was spent to finance the campaign. Post-1MDB, the estimates of spending have risen to RM4 billion. We are likely never to know the real amount, given the money-laundering issues and scope of the 1MDB scandal. This election it is hard to determine the total amount of campaign spending as much of it is hidden, targeted rather than splashed around. 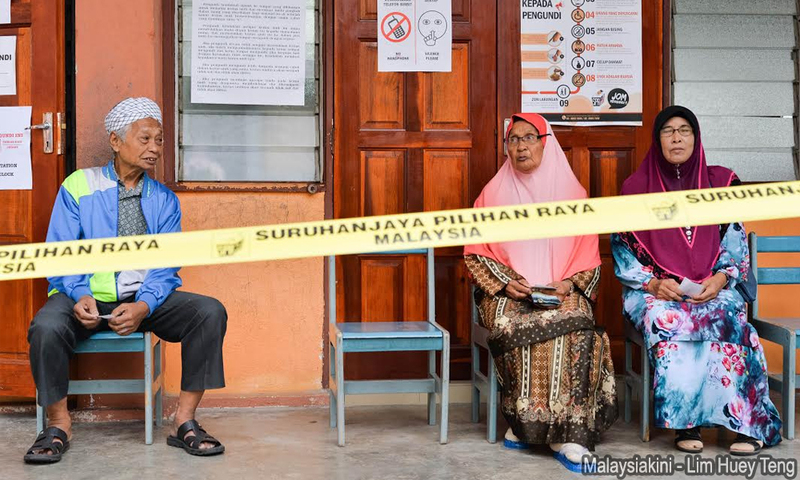 Each Umno division is supposedly receiving large distributions in different tranches. The expensive billboards in cities, especially in Kuala Lumpur, and slick dominance of social media are reminders of the BN’s resource advantage. As with previous elections, the spirit of the Election Offences Act limiting candidate spending is not being observed. This appears the case across the party divide. It is not just a matter of candidate or party spending. There is no accountability. This includes opposition parties as well. The question of where money is coming from, especially the BN largesse of funds, remains unanswered. Speculation is rife that funds are being brought in from outside. Some accuse China or Saudi Arabia, pointing to significant funding tied to pre-election deals. It is not just about potential foreign funding. There continue to be reports that domestic businesses (especially those that have been seen to benefit from political favour) have been approached for funds and that individuals have built private war chests (some of which is being stored for post-election party polls). There is also discussion that favoured tycoons of the Mahathir era have entered the non-transparent and non-accountable campaign finance fray. The National Consultative Committee on Political Finance has not yielded the much-needed finance reform. All the political parties need to take responsibility for this lack of action. 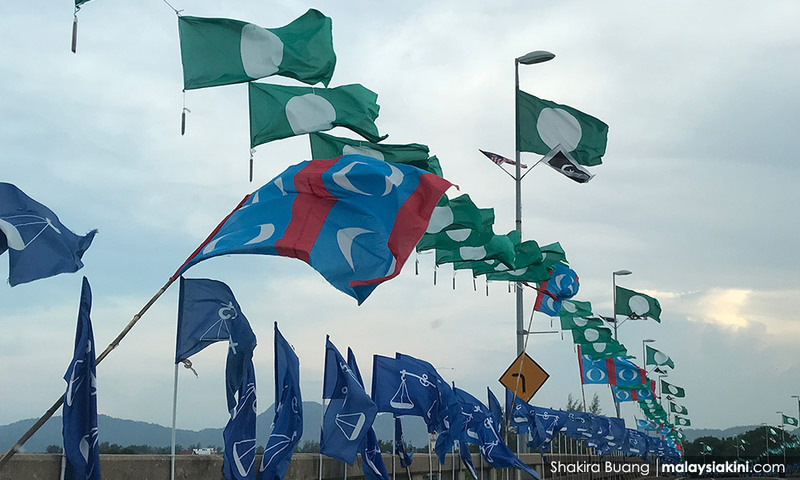 GE14 brings to the fore – once again – how serious the problem of campaign finance is for electoral integrity and public accountability in Malaysia. We are at the stage of the campaign where money is starting to go down in earnest. Carpet bombing in Sabah in places such as Batu Sapi and Pensiangan. Cash payouts to villagers in rural Perak and Felda areas in Negeri Sembilan and even in semi-rural areas in Johor. People are saying: “show me the money”. This is arguably the most important tactic the BN government is using to try to reverse the momentum against them during the campaign to hold onto power. Many believe it will work. Money this time however comes with greater risks, as it appears to have less connectivity and is backfiring by fostering resentment within and outside of Najib’s political base. We will see on Wednesday whether Najib’s style of money politics proves to be his own political lifesaver.